This chess set has a practical and self storage book style design with beautiful felted & weighted chessmen. The case measures 12” x 6” when closed. The King measures 2 ½” inches. The wood chessboard is finished with a gorgeous blend of walnut and oak wood and features convenient built-in handle. The Staunton chess pieces have a classic motif with rich walnut oak wood chessmen. Flipping the board over reveals a backgammon playing field which includes matching backgammon pieces dice and dice cups. As a 3rd game option, backgammon pieces can also be used for a game of checkers! After play, the board folds away to house and protect your pieces. The board measures 16" x 16". The King measures 3.25". The wood chessboard is finished with a gorgeous blend of walnut and oak wood and features convenient built-in handle. The Staunton chess pieces have a classic motif with rich walnut oak wood chessmen. The board measures 16" x 16". The King measures 3.25". This Beautiful Chess and Checkers game set is made out of solid walnut wood and comes with a convenient storage compartment for all your game pieces. The set includes a 15” board set in a fabulous looking walnut wood case with routed curved edging. Includes 32 meticulously crafted chessmen and checkers pieces. A great set at an excellent price! One of our most popular selling sets! This interesting set features a stunning combination of honey rosewood and boxwood with a French Staunton design. The set measures 16" x 16" with 1 1/2" squares and 32 chessmen pieces. The king measures 2 1/2". This rich walnut finish of our deluxe folding chess set shows off the beige and walnut chessboard. The Staunton chess pieces have a classic motif and are weighted for convenient play. Opposing sides are finished in deep walnut & light oak wood. The board measures 17" x 17". The King measures 3.75". This chess set is sure to please the eye. 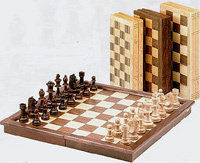 The set has a unique French design, features a decorative ebony chessboard. The chessboard measures 14”. This is the perfect set for all chess players, from beginners to experts. The king measures 3"
This gorgeous French Style Chess Set features a generously sized 15” chessboard is intricately made from the finest cuts of walnut and maple woods complimented by beautiful weighted and felted hand painted and hand polished sheesham boxwood pieces. This is a set that is sure to be adore for generations! The king measures 3 inches. Looking for a chess set with a unique look? 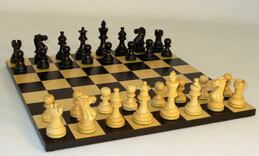 This prestigious set is includes a gorgeous black-stained French designed chessboard and matching chessmen . Chess game pieces are weighted, hand polished intricately made from the finest ebony and box wood.A beautiful set that can be displayed as a centerpiece for a very reasonable price! This supreme chess set was intricately made with attention to detail. This fabulous chess set features a 12” x 12” maple chessboard with chest design for storage of chess pieces. 32 Classic French Knight Style Staunton black and natural boxwood chessmen that areweighted and felted for better play. The king of this set is 3" high. A wonderful set for the novice and experienced chess player! This elegant set features a 15.75” chessboard made from sapele and maple with border inlay- 32 sheesham and boxwood French Staunton weighted and felted chessmen. The king measures 3”. The game of chess can be very rewarding and the experienced chess player would be very familiar with this feeling, specially when he plays with a beautiful set like this one. This magnificent chess set features black and natural boxwood American Emperor double weighted and felted for better game play. The set measures 14” x 14” with 1.5” squares and a 3” king. 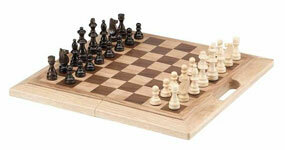 This small wooden chess set has an elegant and sophisticated look. The chessboard is made from maple/black veneer which provide a bold contrast and rich appearance. The Staunton chess pieces in this portable set have a French Knight classic motif and are color coordinated with the board for a balanced look. The board measures 14" x 14". The King is 4" tall. This magnificent Chess set features a chessboard and Black American Emperor Basic chess pieces that are made from the finest cuts of wood, and are properly double weighted to improve play. The set measures 14” x 14” with 1.75” squares and a 3” king. CS305-35BR-BB. Russian Style Boxwood & Maple Chess Set. This handsome Russian Style Chess Set features a 14 " chessboard and beautiful chess pieces with 3.5" King. The appealing black stained and natural maple chessboard offers a pleasant playing surface with contrasting weighted boxwood chess pieces that are hand crafted of and are hand-polished for optimal appearance. CS010-1046. 19" Classic Staunton Chess & Checkers Combo With Drawer. Our best selling walnut chess and checkers combination set features a beveled outer border and a felt-lined storage drawer. The hand carved Staunton boxwood chess and checker pieces have a mahogany and light oak finish. The board is 19 x 19 inches & the king is 4 inches in height. This exquisite chess set features a 14” chessboard made from rosewood and maple wood and 32 beautiful American Emperor rosewood chessmen pieces that are double weighted with felted bottoms for better play. The king measures 3” tall. This is one of our most exclusive and luxurious chess set that is perfect for the most refined and educate chess player. The set features a generously sized chessboard made from the best cuts of maple and ebony woods with beautiful corners and border inlay. The chessboard is complimented with gorgeous French Knight Staunton ebony and boxwood chessmen that are weighted and felted for better play. The set measures 18” x 18” with 2” squares and a 3 3/4” king. This executive chess set has the look of distinction that you have been looking for! Featuring Old Russian Staunton chessmen that are double weighted with felted bottoms, hand crafted and hand polished from sheesham wood . The chessboard of this elegant set is made from ebony and birdseye maple wood with rounded corner and a beautiful border inlay. The set measures 19.25”x 19.25” with 2” squares and a 3.75” king. 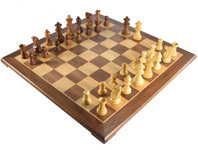 This tournament size chess and checkers combination game set crafted in walnut wood. 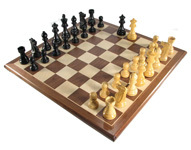 The set includes 32 solid wood chessmen and checkers pieces and a 22" x 22" chess board. The kings measure 6" in height! The wooden chess pieces are weighted, to provide extra stability and control. All game pieces are stored in segregated compartments within a storage tray and can easily be tucked away underneathe the board when not in use. An excellent full size set at a great price! CS703-103-451 Staunton Championship Walnut and Sycamore Chess Set. This magnificent and elegant knight chess set was made in spain by our best artisans. The set features a sycamore/walnut chessboard with mosaic border inlay and 34 intricate hand carved walnut/natural chessmen. The king of this set measure 4 ½” with a 1 ½” base. The squares of this board are 2”. This chess set is a work of art sure to become a centerpiece of any game room! The set comes with a 17.75” chessboard made from maple birdseye and ebony wood with beautiful graceful rounded corners and border frame. The double weighted and felted sheesham/ebony gloss Classic Staunton chessmen a handsome unique look and ease of playing. The king measures 3.75” tall. This is a beautiful set that features hand crafted heavy weighted maple chessmen with deluxe chessboard of inlaid sycamore and walnut and inlaid mosaic borders. The squares are 2 1/4",King: Height 6", Base Diameter 2". The board measures 23" x 23".